MRSA is a Gram positive bacterium with a circular chromosome of 2.2-2.8 Mbp and varieties of extra-chromosomal elements that include plasmids, phages and other mobile elements . The genome of S. aureus encodes chromosomal and extra-chromosomal virulence determinants, antibiotic resistance genes and multi-drug efflux genes (MDE) which play significant roles in the pathogenesis of S. aureus-associated infections and poor antibiotic therapeutic outcome ; thereby increasing patient suffering and sustained epidemics. The MDE genes are bacterial survival mechanisms responsible for pumping out antibiotics and other biocides from the cytoplasm . These efflux pumps can either be chromosomal or plasmid encoded and are able to extrude specific and/or different classes of antimicrobial compounds including biocides . The MDEs are grouped into five families based on their structure and the kinetics of their activities: (i) the major facilitator superfamily (MFS), (ii) the small multi-drug resistance (SMR) family, (iii) the multi-drug and toxic compound extrusion (MATE) family, (iv) the resistance-nodulation-cell division (RND) superfamily and (v) the adenosine-triphosphate (ATP)-binding cassette (ABC) superfamily. Several MDEs have been described in S. aureus Table (S1) that contribute to the antimicrobial resistance mechanisms in this pathogen . Previous studies have reported the prevalence and diversity of clinical MRSA isolate in Pretoria, South Africa [4, 5]. However, there are no reports on the distribution patterns of the multidrug efflux genes of the clinical isolates in South Africa. In addition, studies on antimicrobial profiling of S. aureus isolates often report the minimum inhibitor concentrations (MIC) of the tested antimicrobial and neglect the evaluation of the growth dynamics of the isolates; an assessment that could provide insight into the growth characteristics of the pathogen in response to antibiotics. This report reveals that all S. aureus isolates, be it of MRSA or MSSA genotype, do not contain the same set of MDEs despite being isolated from the same hospital setting and that there are at least four groups of specific growth-response pattern showing resistance to the model I lactam antibiotic, methicillin. The clinical use of methicillin as antibiotics has been halted in many countries due to the development of resistance by microbes to this antimicrobial agent. However, this phenomenon makes it a useful tool in unravelling the resistance mechanisms to β lactam antibiotics for the following reasons: (a) Methicillin forms the chemical backbone for modern β lactam antibiotics. (b) Most clinical S. aureus isolates are likely to develop resistance to this chemical agent due to the presence of mecA gene in MRSA or due to exposure to modern β lactam antibiotics sharing similar chemical structure (c) Methicillin is insensitive to the S. aureus encoded beta lactamase  thus, making it possible to rule out the effect of antibiotic degradation. The MDEs investigated in this study are limited to those reported in Costa et al. and covers the main classes of MDEs so far identified in S. aureus Table (1). Ninety-seven previously characterized Staphyloccocal isolates were obtained from the Diagnostic Laboratory, Department of Medical Microbiology, University of Pretoria Tshwane Academic Division, National Health Laboratory Service, South Africa. These consisted of 81 MRSA and 16 MSSA isolates. The specimen were collected from Tshwane Academic Hospital in Pretoria, South Africa with Research Ethics Approval (protocol number 394/2014) from the Faculty of Health Sciences, University of Pretoria. Total bacterial DNA purification. Each isolate was plated out on blood agar to ensure the purity and a single colony inoculated in Brain heart infusion (BHI) broth (Oxoid, England) and incubated (Scientific Incubator, Vacutec, South Africa) at 37˚C for 24 h.
The genomic DNA from individual isolates was extracted using the ZR Fungal/Bacterial DNA Miniprep (Zymo Research Corporation, USA) according to the manufacturer’s instruction and the specific genes encoding multi-drug efflux genes were detected by multiplex-PCR using target-specific primers (Table 1). The amplification of the target genes was performed in a 25 µl reaction mix (Table S2) using a cycliplex PCR strategy  which involves a single optimized-PCR condition that allows multiplexing of different gene target-primer sets in different PCR tubes and run at once thereby saving time (Table S2). The identity of each isolates as MRSA or MSSA was reconfirmed by PCR detection of the S. aureus mecA genes as previously described [4, 8]. To assess the general PCR performance, the eubacterial 16S rDNA V3 region was also targeted in each batch of PCR run as described previously . Table 1. List of primers for multiplex PCR assays. All PCR amplicons were fractionated in 2.5% agarose gel (NuSieve ™ GTG ™ agarose, Whitehead scientific, South Africa) and visualized under UV light for digital documentation. A 100 bp DNA ladder (Thermo Scientific, South Africa) was included in the electrophoresis run for estimation of the amplicon size. The distribution of the MDEs in each isolate was recorded. A total of 24 isolates consisting of a minimum of two isolates from a cluster of MRSA or MSSA as determined by UPGMA (Unweighted Pair Group Method with Arithmetic Mean) clustering of the MDEs distribution in each isolate Fig. (S1), were used for this assay. Single outliers that did not cluster with any other isolate were also included. The methicillin (Sigma Aldrich; South Africa) SCs for the 24 clinical MRSA and MSSA isolates were determined using the micro-dilution method as described in the Clinical and Laboratory Standards Institute (9). Briefly, 5 X 104 CFU/ml of each isolate was incubated in Tryptone soya broth (Oxoid, South Africa) in the presence of 0.5, 1, 2, 4, 8 and 16 µg/ml methicillin for 16 hr at 37 ˚C. The visual SCs were defined as susceptible (no visual growth observed); resistant (micro-well completely covered with bacteria; and intermediate resistance (about 1-4 dot-like growth observed in the micro-well). Two independent tests were performed to assess reproducibility. The MIC was taken as the minimum concentration in which no visual bacterial growth was observed. The growth of the 24 S. aureus isolates was also determined by quantitative analysis of spectrophotometric measurements of the optical density (absorption) at 600nm after the 16 h incubation period. The S. aureus MU50 ATCC 700699 was used as control in the spectrophotometric measurements. The distribution pattern of MDEs in each MRSA/MSSA and the growth dynamics of representative isolates were evaluated using a UPGMA (Unweighted Pair Group Method with Arithmetic Mean) dendrogram constructed by hierarchical clustering with a Jaccard Tanimoto co-efficient and a distance value estimated using the formula d = (1-r) X 100. The results are presented in a table format for clarity. A correlation statistics of the co-existence of MDEs in the MRSA and MSSA isolates was determined by Pearson’s correlation with p ≥ 0.05 and the result rendered as a heatmap matrix with the aid of Plotly, an open source program (https://plot.ly/). In other to evaluate the distribution pattern of the MDEs, all the isolates were reconfirmed as MRSA or MSSA and the PCR strategy used for the MDEs used proved to be robust and showed distinct and clear bands on the electrophoretic gel (Fig. S2). The distribution pattern of the detected MDEs in the clinical MRSA and MSSA isolates clustered into three major groups (Fig. S1 and Table S3). All the 11 MDE genes assessed in this study were detected in 35.05% (34/97) of the total isolates; out of which, 8.82% (3/34) were MSSA. The smr and qacA/B genes were not detected in 31.96% (31/97) of the all isolates, which, however; harboured nine other MDEs. The MSSA represented 16.1% (5/31) of this cluster. Moreover, MDEs including norC, sdrM and qacA/B were not detected in 12.37% (12/97) of the isolates, which hitherto had 8 other MDEs. This cluster included 50%(6/12) MSSA isolates. Other clusters/outliers included isolates numbers ranging from 1-4 and made up to 21.2% of the total S. aureus isolates. We did not observe any correlation between the genomic location (chromosomal or plasmid) of the MDEs and their distribution pattern in all the isolates. A strong positive correlation (Pearson coefficient =1) was observed for the co-existence of norA, norB and tet38 efflux genes. This was followed by qacA/B and smr (Pearson coefficient = 0.89) which were present in 41.24% (40/97) and 44.33% (44/97) of the isolates, respectively (Table S4). Weak negative correlations were also observed for the co-existence of tet38 and other MDE genes including norA, norB and qacA/B (Table S4). Heatmap matrix Fig. (1) revealed the tendency of norC, sdrM, smr and qacA/B to be co-absent in some S. aureus strains especially in the MSSA (Table S5). Fig. (1). Heatmap matrix showing a visual representation of the distribution pattern of the 11 MDEs in MRSA and MSSA isolates. The blue reagions indicate the set of isolates in which an MDE was not detected while the red regions indicate the set of isolates in which the MDEs were detected by PCR. A similarity in the distribution pattern of qacA/B and smr; norA and norB can be seen. The observed individual prevalence of the other MDEs evaluated included norA (98.9%; 96/97); norB (98.9%; 96/97); mepA (97.9%; 95/97); tet38 (98.9%; 96/97); sepA (96.9%; 94/97); MdeA (95.9%; 93/97); lmrs (88.7%; 86/97); sdrM (85.6%; 83/97) and norC (79.4%; 77/97) (Table S5). 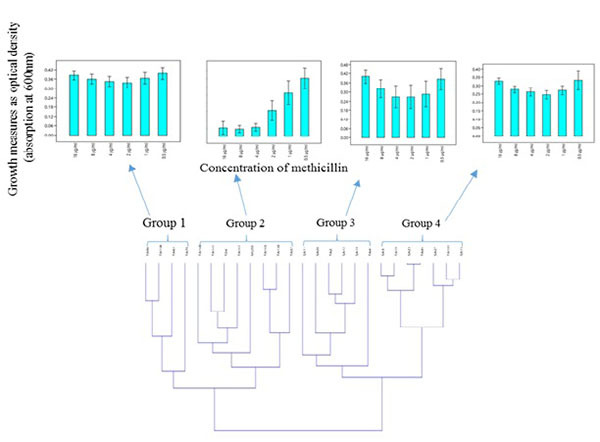 Hierarchical clustering based on the spectrophotometric measurement of the growth of clinical S. aureus isolates in the presence of different concentration of methicillin, revealed two major clusters made up of four groups which showed heterogeneity in their response to methicillin Fig. (2A). Moreover, MRSA and MSSA isolates co-clustered (Fig. 2B); Groups 3 and 4) in relation to their growth trend. Assessment of the individual MRSA and MSSA isolates within the co-clusters showed that they had similar growth-response phenotype (Fig. 3). However, MRSA isolates exclusively made up other clusters (Fig. 2B); Groups 1 and 2). There was no correlation between the specimen type or the hospital unit where the specimen were collected (Table S6). The phenotypic characteristics of the four groups are as follows: Group 1: Those that were resistant at all tested concentrations of methicillin and therefore showed no dose-dependent difference in the level of growth. Group 2: Those that showed typical dose-dependent growth reduction in the presence of methicillin. Group 3: Those that appeared to display a growth trend that was directly proportional to the methicillin dose increment from 1-16 µg/ml. The S. aureus MU50 ATCC 700699 was clustered in this group. Group 4: Isolates that showed similar growth trend were observed in Group 3, however, with a lower average growth. Correlation analysis of quantitative spectrophotometric growth measurements and the distribution of MDEs in the 24 S. aureus isolates revealed no specific correlation between the distribution pattern of MDEs and the concentrations of methicillin tested in this study (Data not shown). Fig. (2). A: A dendrogram showing the co-clustering of clinical MRSA and MSSA isolates. 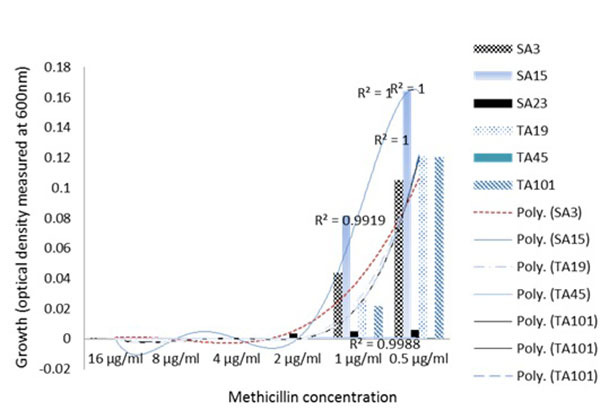 B: Cluster-dependent heterogenic growth response to methicillin based on the general trend of the contribution of each isolates in a cluster. The error bar shows standard error from the mean. Groups 1 and 2 show exclusive clustering of MRSA while Groups 3 and 4 show co-clustering of MSSA and MRSA isolates. Samples ID with SA are MSSA and those with TA are MRSA. Visual SC determination of the 24 representative S. aureus isolates (based on the MDE distribution pattern) showed that two (11.8%; 2/17) MRSA and two (28.6%; 2/7) MSSA isolates had an MIC of 0.5 µg/ml; two (11.8%; 2/17) MRSA and MSSA isolates had MIC of 2 µg/ml respectively, while two (28.6%; 2/7) MSSA isolates had an MIC of 4 µg/ml Table (2). As expected, most of the MRSA (76.5%; 13/17) isolates were resistant to methicillin while the MSSA isolates (57.1%; 4/6) were susceptible. Intermediate resistance (1-4 spots of bacterial growth in the micro-wells) ranging from 8-16 µg/ml was observed in two (11.8%; 2/17) of the representative MRSA isolates. Intermediate resistance ranging from 1-16µg/ml was observed in four (50%; 4/8) of the MSSA (Table S4). Table 2. Visual MIC and SC determination on the 24 representative S. aureus isolates (based on the MDE distribution pattern). Staphylococcus aureus-associated diseases remain a threat to human and animal health. Methicillin-resistant Staphylococcus aureus (MRSA) across the world often leave clinicians with little or no choice of treatment options [9, 10]. As the genetic diverity of this pathogen increases [11, 12] and fewer new antibiotics are entering into clinical use, efforts are being renewed to boost the activity of old antimicrobials to which pathogens have developed resistance. These efforts include the implementation of antibiotic stewardship which includes strategic use of antibiotics  and the development of antibiotic adjuvants such as efflux pumps inhibitors to counter resistance and/or enhance the activity of antibiotics in clinical use . To contribute to this effort, this study revealed three major clusters of MDE distribution patterns in the clinical S. aureus isolates obtained from a hospital in South Africa suggesting that all members of the same bacterial species may not contain the same MDEs as previously suggested . The prevalence of qacA/B gene in this study (35.08%) is higher compared to that reported in a Japanese hospital (23.6%) (16). Moreover, smr gene which has a lower activity compared to qacA/B gene (2) was present in 43.3% of the isolates and higher in prevalence compared to that of the Japanese study (4.2%) . Fig. (3). Homogenous response pattern to methicillin by MRSA and MSSA. The lines linking each methicillin concentration indicate polynomial trends of the bacterial growth. Isolates IDs with TA indicate MRSA while SA indicate MSSA. It has been shown that most efflux pumps inhibitors have been focused on norA . The observations in this study indicate the importance of expanding this effort to cover other MDEs. Moreover, the detection of norA, norB norC, mepA and sdrM in all the isolates corroborates with the focus on these important MDE efflux pumps and suggest the potential for resistance to flouroquinolones incuding norfloxacin, ciprofloxacin and sparfloxacin [2, 14]. Our laboratory is looking for the possible correlation between the presence of these genes and resistance to flouroquinolones. The high prevalence of mdeA, sepA, and mepA is particularly worrisome and suggests a high risk of resistance to a wide range of commonly used antiseptics, biocides and antibiotics of different chemical class . Similarly, tet38 which is involved in the extrusion of tetracycline  was absent only in one MRSA isolate indicating a high prevalence of this gene in the S. aureus isolated from patients attending the health care facility. Interestingly, we found an isolate (TA162) which harboured only qacA/B and smr (Table S3). Repeated PCR assays indicated a consistent result for this isolate. It is not known whether this was due to mutations in the genes that prevented primer recognition of target sites in this isolate or this isolate simply evolved differently from the other isolates tested in this study. Further assessment of this isolate is the next step to be followed in our laboratory. Moreover, this study showed the co-existence and co-absence of some MDEs in the S. aureus strains suggesting a possible co-evolution of these genes in the pathogens. It is not certain if the co-absence of norC, sdrM, smr and qacA/B in the MSSA strains plays a role in susceptibility to antibiotics compared to the MRSA. 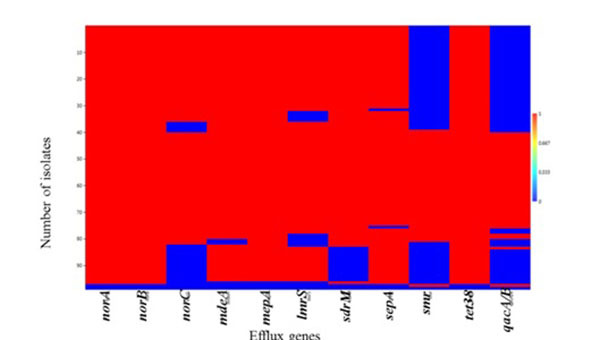 Although it is not known what factor drives the different distribution of efflux genes in the S. aureus isolates in this study, it is thought that antibiotic resistance is a natural ecological phenomenon resulting from years of evolutionary process that may include a combination of different mechanisms . It has been suggested that MDEs may also play a role in virulence of bacteria as these factors assist in colonization of the host tissue by removing host bile salts and antimicrobial peptides that may prevent colonization process [18-20]. The finding of different distribution patterns in individual isolates begs the question of ‘what roles do the different distribution patterns have in these isolates? Pearsons correlation analysis suggested that none of the combinations of MDEs evaluated in this study had an obvious effect on the β-lactam, methicilin. However, the effect of individual MDE on the resistance pattern could not be assessed using this experimental design. No correlation was observed between the MDEs distribution pattern in an isolate and SCCmec type (Data not shown). By evaluating the visual MIC, SC and the growth dynamics in the presence of methicilin, the resistance phenotype of the clinical MRSA and MSSA isolates could be determined. Importantly, some MRSA and MSSA isolates demonstrated similar susceptibility even at 0.5 µg/ml methicilin, or resistance at concentration as high as 16 µg/ml (Fig. 2). This suggest that despite the lack of mecA genes in MSSA isolates, phenotypic resistance characteristics should not be overlooked in clinical settings. Similarly, phenotypic assessment of the resistance mechanism in the clinical S. aureus isolates using spectrophotometric measurements of the growth in TSB media, showed two major clusters consisting of four groups of specific growth-response pattern showing the resistance to the model β lactam antibiotic, methicillin. The clustering of the well characterized S. aureus MU50 ATCC 799600 to Group 2 which showed a dose-dependent response in contrast to other groups (Fig. 2A) clearly showed that there exist phenotypic differences in the resistance pattern of clinial MRSA to methicilin and perhaps other β lactams with similar physicochemical properties. This quantitative analysis proved valuable in being able to reveal the growth dynamics of the isolates evaluated and showed that a group of isolates (Fig. 2B); Groups 3 and 4) actually had higher growth as the methicillin concentration increased. Another instance of the advantage provided by spectrophotometric bacterial growth measurement can be seen in Group 3 (Fig. 2A) in which isolates SA11, SA28, TA2, SA12, SA19 and TA41 showed increasing optical densities in response to higher concentrations (4-16 µg/ml) of methicillin, despite the fact that the MSSA isolates SA11, SA28 and SA12 were classified as susceptible at this concentrations (Table 2) based on the visual MIC assessment criteria for describing susceptibility as indicated in the method section. Interestingly, these isolates co-clustered with MRSA isolates TA41 and TA12 which displayed resistance at these concentrations thus indicating that the co-clustering was based mainly on the growth dynamics and independent of the genotype. These observations are contrary to reported hormesis effect where low doses of antibiotics are associated with increased bacterial growth [21, 22]. Subsistence of environmental bacteria on antibiotics has been previously reported . However, to our knowledge, this event has not been reported in clinical S. aureus isolates. Although it is not known if this observation was a result of direct utilization of methicillin as a carbon source or a trigger of other mechanisms that promote the bacterial growth, this observation represents a potential S. aureus resistance mechanism to methicilin and perhaps other β lactam antibiotics with similar structural and physicochemical properties. Theoretically, the clinical importance of these findings is that patients infected with these set of MSSA isolates may likely be prescribed/administered with antibiotic regimen that may not be able to kill the pathogen. In conclusion, this study describes the diversity of MDEs in a hospital in South Africa and shows that there were at least three major distribution patterns of MDEs in the clinical isolates evaluated. This information is important for the development of antibiotic adjuvants that target the inhibition of MDE in S. aureus. In addition, we report that S. aureus isolates, be it of MRSA or MSSA genotype, do not contain the same set of MDEs despite being recovered from the same hospital setting. The high prevalence of MDEs suggestive of resistance to a broad spectrum of biocides and fluoroquinolones is particularly disturbing. A limitation of this study is the lack of CFU/mL data which would have shown the actual log increase or decrease in bacterial growth. However, a previous report demonstrated a strong correlation between optical density (absorption) measurement of S. aureus growth and CFU/mL [24-30]. Finally, at least four specific growth-response patterns of S. aureus in the presence of a model β lactam antibiotic (methicillin) were observed and included the enhancement of S. aureus growth in the presence of the antimicrobial agent. This study was funded by the National Research Council (MRC) and the National Research Foundation (NRF) of South Africa. Mlynarczyk A, Mlynarczyk G, Jeljaszewicz J. The genome of Staphylococcus aureus: A review. Zentralbl Bakteriol 1998; 287: 277-314. Costa SS, Viveiros M, Amaral L, Couto I. Multidrug efflux pumps in Staphylococcus aureus: an update. Open Microbiol J 2013; 7: 59-71. Huet AA, Raygada JL, Mendiratta K, Seo SM, Kaatz GW. Multidrug efflux pump overexpression in Staphylococcus aureus after single and multiple in vitro exposures to biocides and dyes. Microbiol-Sgm 2008; 154: 3144-53. Makgotlho PE, Kock MM, Hoosen A, et al. Molecular identification and genotyping of MRSA isolates. FEMS Immunol Med Microbiol 2009; 57: 104-15. Oosthuysen WF, Orth H, Lombard C, Sinha B, Wasserman E. In vitro characterization of representative clinical South African Staphylococcus aureus isolates from various clonal lineages. New Microbes New Infect 2014; 2: 115-22. Zeng X, Lin J. Beta-lactamase induction and cell wall metabolism in gram-negative bacteria. Front Microbiol 2013; 4. Antiabong JF, Ball AS, Brown MH. The effects of iron limitation and cell density on prokaryotic metabolism and gene expression: Excerpts from Fusobacterium necrophorum strain 774 (sheep isolate). Gene 2015; 563: 94-102. McClure JA, Conly JM, Elsayed S, Zhang K. Multiplex-PCR assay to facilitate identification of the recently described staphylococcal cassette chromosome mec type VIII. Mol Cell Probes 2010; 24: 229-32. Clinical and Laboratory Standards Institute. Performance standards for antimicrobial susceptibility testing. Clinical and Laboratory Standards Institute Twenty-Fouth Informational Supplement Document M100-S24 C, 2014.Wayne, USA. 2014. Gordon RJ, Lowy FD. Pathogenesis of methicillin-resistant Staphylococcus aureus infection. Clin Infect Dis 2008; 46: S350-9. Van der Kooi-Pol Y. High genetic diversity of staphylococcus aureus strains colonizing patients with epidermolysis bullosa. Exp Dermatol 2012; 21: 463-6. Antiabong JF, Kock MM, Maphanga TG, Salawu AM, Ehlers MM. Diversity of MRSA SCCmec elements in Pretoria region of South Africa: The problem of variation in the assigned SCCmec types by different multiplex-polymerase chain reaction (pcr) methods and a call for an African consensus. Am J Ment Retard 2016; 10: 775-82. Kullar R, Davis SL, Kaye KS, Levine DP, Pogue JM, Rybak MJ. Implementation of an antimicrobial stewardship pathway with daptomycin for optimal treatment of methicillin-resistant Staphylococcus aureus bacteremia. Pharmacotherapy 2013; 33: 3-10. Handzlik J, Matys A, Kieć-Kononowicz K. Recent Advances in Multi-Drug Resistance (MDR) Efflux Pump Inhibitors of Gram-Positive Bacteria S. aureus. Antibiotics (Basel) 2013; 2: 28. Martinez JL, Sanchez MB, Martinez-Solano L, et al. Functional role of bacterial multidrug efflux pumps in microbial natural ecosystems. FEMS Microbiol Rev 2009; 33: 430-49. Alam MM, Kobayashi N, Uehara N, Watanabe N. Analysis on distribution and genomic diversity of high-level antiseptic resistance genes qacA and qacB in human clinical isolates of Staphylococcus aureus. Microb Drug Resist 2003; 9: 109-21. Blair JM, Webber MA, Baylay AJ, Ogbolu DO, Piddock LJ. Molecular mechanisms of antibiotic resistance. Nat Rev Microbiol 2015; 13: 42-51. Begley M, Gahan CG, Hill C. The interaction between bacteria and bile. FEMS Microbiol Rev 2005; 29: 625-51. Drake DR, Brogden KA, Dawson DV, Wertz PW. Thematic review series: skin lipids. antimicrobial lipids at the skin surface. J Lipid Res 2008; 49: 4-11. Pearson JP, Gray KM, Passador L, et al. Structure of the autoinducer required for expression of Pseudomonas aeruginosa virulence genes. Proc Natl Acad Sci USA 1994; 91: 197-201. Migliore L, Rotini A, Thaller MC. Low doses of tetracycline trigger the E. coli growth: A case of hormetic response. Dose Response 2013; 11: 550-7. Davies J, Spiegelman GB, Yim G. The world of subinhibitory antibiotic concentrations. Curr Opin Microbiol 2006; 9: 445-53. Dantas G, Sommer M, Oluwasegun R, Church G. Bacteria subsisting on antibiotics. Science 2008; 320: 100-3. Mayer S, Boos M, Beyer A, Fluit AC, Schmitz FJ. Distribution of the antiseptic resistance genes qacA, qacB and qacC in 497 methicillin-resistant and -susceptible European isolates of Staphylococcus aureus -. J Antimicrob Chemother 2001; 47: 896-7. Noguchi N, Nakaminami H, Nishijima S, Kurokawa I, So H, Sasatsu M. Antimicrobial agent of susceptibilities and antiseptic resistance gene distribution among methicillin-resistant Staphylococcus aureus isolates from patients with impetigo and staphylococcal scalded skin syndrome. J Clin Microbiol 2006; 44: 2119-25. Costa SS, Falcao C, Viveiros M, et al. Exploring the contribution of efflux on the resistance to fluoroquinolones in clinical isolates of Staphylococcus aureus. BMC Microbiol 2011; 13: 241. Couto I, Costa SS, Viveiros M, Martins M, Amaral L. Efflux-mediated response of Staphylococcus aureus exposed to ethidium bromide. J Antimicrob Chemother 2008; 62: 504-13. Huang J, O'Toole PW, Shen W, et al. Novel chromosomally encoded multidrug efflux transporter MdeA in Staphylococcus aureus. Antimicrob Agents Chemother 2004; 48: 909-17. Muyzer G, de Waal EC, Uitterlinden AG. Profiling of complex microbial populations by denaturing gradient gel electrophoresis analysis of polymerase chain reaction-amplified genes coding for 16S rRNA. Appl Environ Microbiol 1993; 59: 695-700. Domínguez MC, de la Rosa MM, Borobio VM. Application of a spectrophotometric method for the determination of post-antibiotic effect and comparison with viable counts in agar. Antimicrob Chemother 2001; 47(4): 391-8.